Situated in the beautiful Nene Valley, the club is within easy access of the major roads just off the A45 with its direct link to the M1 A14 and A6. 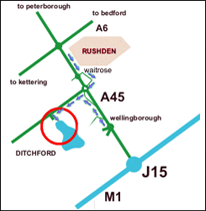 Leave the A45 at junction 16, then at roundabout take the 1st exit onto Ditchford Road. Lake entrance is 200m on the left. NOTE: Full members will recieve a key for the lake to come and go as they please.